America’s 19th century ranchers saw wolves as outlaws that needed to be removed. One of the most notorious was named Lobo by his frustrated pursuers, and as tales of his elusiveness spread, the bounty on Lobo’s head grew larger. This is the story of one wolf doing his best to survive with all the odds against him. New Wolves Head to Isle Royale Scientists have studied the interactions of wolves and moose on Michigan’s Isle Royale for about 60 years. Now, after determining and analyzing the possible outcomes, The National Park Service is about to introduce new wolves—and new bloodlines—into the mix there. This is the background on a carefully considered intervention. Download full article. 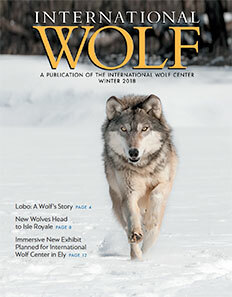 International Wolf Center lovers, take note! By Memorial Day, a brand new experience will await you there. “Wolves and Humans,” having served since 1993, will be replaced by a dynamic new exhibit that tells the story of wolves today. Reflecting a modern understanding of wolves and the environment, it will delight and inform guests in a whole new way. This past summer, I felt heartbroken to read emails from advocacy organizations about a female orca in Puget Sound that had lost her newborn calf but was unwilling to let go of its body for nearly two weeks. From what was being conveyed, this was the first calf born to the southern resident orca population since 2015.
f you follow the dynamics of the International Wolf Center Exhibit Pack, you’re aware that we transitioned 10-year-old Aidan into retirement after a winter of testing for rank order by younger pack members. This decision was months in the making; there was no single event that caused the action. There are few people who can claim they have personally nurtured every current member of the Exhibit Pack at the International Wolf Center. Andi Nelson, longtime member and well-versed Center volunteer, is one of those rare people. A malnourished, wild wolf found with a plastic container on its head was rescued when observers called the Nagpur Forest Department and waited with the animal for the rescue team to cut off the container, which had holes that apparently allowed the animal to breathe and drink water, but not to eat. While in some places, wolves are seen as the solution to an over-population of wild herbivores, some farmers here are complaining that too many red deer—so many that domestic cattle must compete for grazing land, and farmers must purchase hay to feed livestock—are attracting wolves to the area, which in turn are eating their cattle, and not the deer. It is believed there are around 14,000 red deer in the region, and farmers fear parasites and infections are spreading from the deer to the cattle. Wolves are ranging outside the Chernobyl Exclusion Zone—the 2,672 square mile (6,920 square kilometer) area that has been sealed off due to safety concerns over radiation fallout since a 1986 nuclear accident in Pripyat, in northern Ukraine. The explosion is considered to have released 400 times more radioactive rays than the atomic bomb dropped on Hiroshima, Japan. In the Ethiopian highlands, researchers from nations including Ethiopia, Norway, Germany, the United Kingdom and the United States studied interactions between African and Ethiopian wolves (neither of which is a true wolf) to determine the impact of their competition for food and territory on the survival of the endangered Ethiopian wolf. Published by the Royal Society, their work explored whether these two canids could successfully share space, or whether the African wolf, formerly called the golden jackal, would out-compete the larger but solitary and ecologically specialized Ethiopian wolf, of which only 500 remain. Read full article. in the case of my fox). by John Benson, Ph. D.
We huddled about 300 meters from the suspected den site. I told Pete and Aaron to hang back—I would go on ahead to find the den. I moved quietly through the misty woods alone. Stopping 100 meters from the suspected den, I was standing along a swampy, flooded area between two ridges. Based on my previous tracking and the strength of the current radio signal, I assumed the den was just beyond the ridge in front of me. I took a moment to draw in a deep breath and relish the moment. The previous month of tracking had paid off, and the conditions were perfect. This was the moment of truth! Aside from werewolves in the fictional “Twilight” series set near Forks, Washington, actual gray wolves haven’t inhabited Olympic National Park in northwest Washington state for almost a century. But a recent study found that the Olympic Mountains could be a suitable place to reintroduce the species. Hundreds of people from 22 countries traveled to the beautiful Marriott Hotel in Minneapolis, Minnesota to hear fascinating stories about wolves of the world at the 2018 International Wolf Symposium, October 11-14. “Wolves in a Changing World” featured the world’s top wolf biologists in plenary sessions and more than 100 oral and poster presentations on topics including wolf-human interactions, management and policy, emerging research and others.